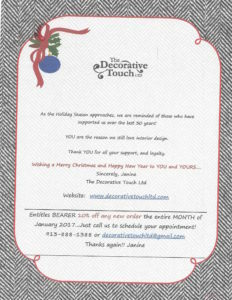 Something Special for YOU for the Holidays | The Decorative Touch Ltd.
We are so grateful for all of our wonderful clients we have worked with over the past 30 years and to show our gratitude we are offering something special for just for you! Please enjoy 10% off any NEW order during the whole month of January 2017. Thank you for your continued support and loyalty and we look forward to working with you in new year!